The Buick LaCrosse receives a mild exterior makeover featuring revised front and rear fascias with optional LED lights, as well as an updated interior with uprated materials, and new seats, central instrument panel and console for 2014. 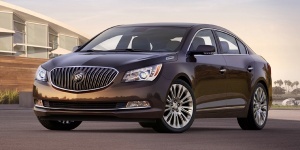 Find the used Buick LaCrosse of your choice from a dealer in your area. Search our used car listings now.